Scholarly works by Associate Dean and Professor Madhavi Sunder and Professor Peter Lee are among the most-cited Intellectual Property law articles, according to a new entry on the blog Written Description. Sunder's article “IP3,” published in the Stanford Law Review in 2006, is listed as one of the top 25 most cited IP articles of the last decade, and the #1 top most cited International IP Article. Lee’s “Patent Law and the Two Cultures” published in the Yale Law Journal in 2010 is listed as one of the top 20 most cited IP articles published in the last 5 years and #8 most cited Patent Law Article of the past 5 years. Congratulations, Professors Sunder and Lee! King Hall hosted an outstanding panel discussion yesterday on the Supreme Court nomination process, nominee Hon. Merrick Garland, and the jurisprudence of the late Justice Antonin Scalia. Photo courtesy the law school's Instagram. 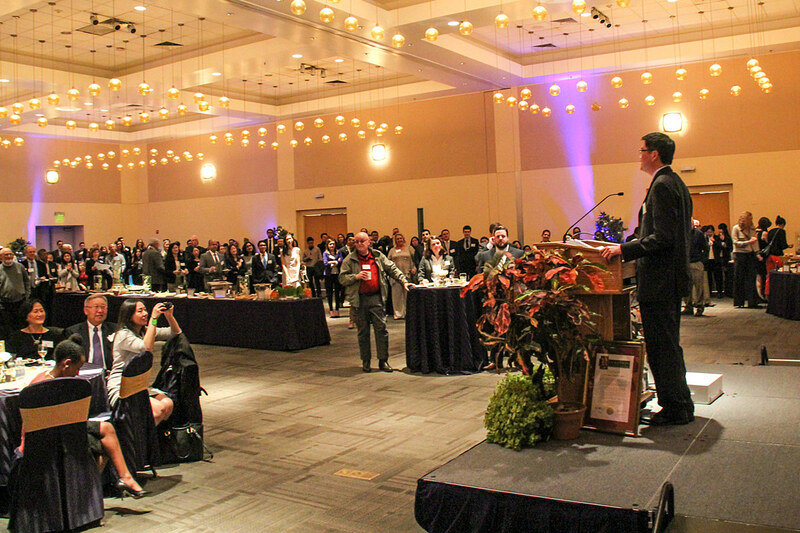 Follow us on Instagram @ucdavislaw! The participants were (left to right): Rose Cuison Villazor, me, Alan E. Brownstein, Albert C. Lin (a former Garland clerk! ), Courtney Joslin, and Carlton F.W. Larson. We had a wide-ranging discussion about issues including originalism, Justice Scalia's jurisprudence regarding the separation of church and state, immigration, family law, and the Second Amendment, as well as the likely political battles ahead for Judge Garland, President Obama's nominee. The event was live-streamed and archived on on YouTube. Watch it now! Thanks to the student chapter of the American Constitution Society (ACS) and Aoki Center for co-sponsoring the panel! Professor Lisa R. Pruitt will give a keynote on Friday, March 25, at Princeton University. Her talk is titled, "Why Rural? (or, On Being a Ruralist)." WASHINGTON - On Tuesday, Hispanics for a Fair Judiciary (HFJ), a non-partisan network of elected officials, legal, civil rights, labor, academic and political leaders, in association with the National Hispanic Leadership Agenda (NHLA), a coalition of the nation's 40 preeminent Latino advocacy organizations, will host a media call to discuss the pending nomination of a Supreme Court Justice. Representatives from the academic, legal, and advocacy communities will address the current gridlock affecting the Senate confirmation process for judicial nominations and discuss the consequences to the state of justice if Senate leaders fail to give President Obama's Supreme Court nominee a fair hearing and vote. HFJ and NHLA will also outline the steps they plan to take to encourage the Senate to act. Please find press conference details provided below. Opportunities for one-on-one interviews are available. Please have the Conference ID readily available to speed up the check-in process. Congratulations to Professor Peter Lee, recipient of the 2016 Distinguished Teaching Award! The honor, made possible through the generosity of Bill and Sally Rutter, was presented at the "Celebrating King Hall" event last night at the ARC Ballroom on the UC Davis campus. 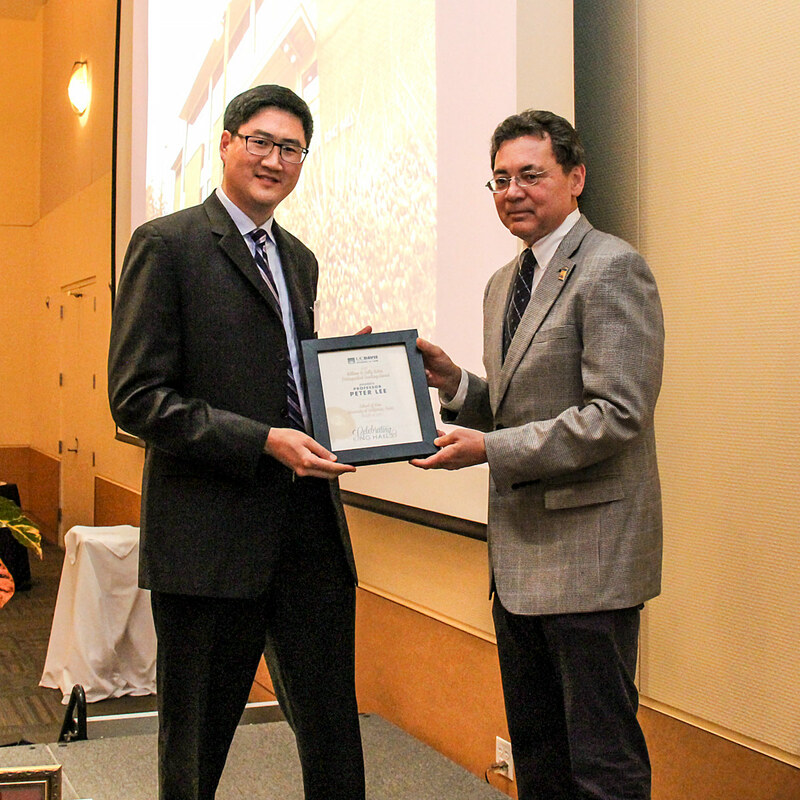 Professor Lee receives the award from Dean Kevin R. Johnson. Professor Lee addresses attendees at "Celebrating King Hall." For more photos from the event, visit the School of Law's Facebook album and Instagram. Cross-posted from the Sacramento Bee. The legal dispute between the FBI and Apple over a locked iPhone is clouded in technical details that are hard for many to understand, an unclear area of law, and a terrible tragedy in San Bernardino that provokes unease and fear. To make matters worse, the FBI and Apple are engaged in a very public battle using open letters, blog posts and hearings before Congress with terms like patriotism, marketability and backdoors. The outcome of the case will affect everyone's ability to keep their personal information safe on their smartphones and all their electronic devices. And it will test what limits exist on the government's ability to force unwilling and innocent third parties to help it investigate crime. A federal judge has issued an order forcing Apple to help the FBI "unlock" the iPhone used by Syed Farook, who with his wife Tashfeen Malik, shot and killed 14 people and seriously wounded 22 in the December attack in San Bernardino. The government is asking Apple to create something that does not now exist: a custom-built version of Apple's operating system that would sidestep security features on the iPhone. Without Apple's assistance, the FBI claims that it is unable to access information that exists only in the phone itself. In addition, because the iPhone would not accept this customized software update without Apple's digital signature - which would otherwise vouch for the software's trustworthiness - the court order compels Apple to do this, too. Local police departments are also eager to seek similar orders from Apple if it loses the San Bernardino case. Indeed, the prospect of forcing Apple to create a permanent in-house hacking department for police purposes was one of the reasons a federal magistrate judge in New York on Monday denied the government's request to compel Apple to unlock an iPhone in a different criminal case involving a drug investigation. Once Apple creates the means to bypass the security features it has created to ensure the security of the information on its phones, that software will be prized not only by law enforcement officials, but also by organized crime rings, identity thieves and foreign intelligence agencies. That's where all of our interests come in. As the U.S. Supreme Court described them recently, smartphones could easily be described as "cameras, video players, rolodexes, calendars, tape recorders, libraries, diaries, albums, televisions, maps or newspapers" - all at the same time. In the San Bernardino case, the government relied upon the All Writs Act of 1789, a federal law intended to provide courts with the power to issue orders to carry out their duties. The act allows a court to issue orders that are "necessary or appropriate" when "agreeable to the usages and principles of law." No one is quite sure what the outer limits of the act may be, but the Apple case is testing those limits. Comey, the FBI director, argues that the San Bernardino tragedy demands it. The problem is that we don't think of law enforcement power simply in terms of its objectives or the gravity of the crime in question. In our legal system, we take the reasonability of the means into account. If Apple is compelled to do this in a terrorism investigation, must it also do so in a drug case? A prostitution case? A delinquent property tax case? What the government seeks, in the words of one friend-of-the-court brief filed by a group of technology companies Thursday, is a demand "unbound by legal limits." The extraordinary law enforcement means of today, if left unchecked, become the routine methods of tomorrow. And if the government is permitted to compel a technology company to create deliberate vulnerabilities in a phone today, very soon it may apply that power to the growing Internet of Things: the world of Internet-connected "smart" thermostats, televisions, toothbrushes and even Barbie dolls. Apple's loss may mean that the FBI could one day force a company to deliver malicious security updates to one of the many smart devices you will own. These are products of convenience, not general consent to government surveillance. Do we want this case to pave the way for routine compulsion of private companies to watch us through our connected devices? We should expect that the FBI and every other law enforcement agency would want to try every means necessary to prevent and investigate crime. But when those means exact a heavy cost upon our information security and privacy, we've struck the wrong bargain. On March 3rd, the Student Wellness Committee (SWC) sponsored its first public panel entitled, "Managing the Legal Beast: Panel Discussion on Navigating Law School and the Legal Profession with your Mental Health Intact." The primary goal of the panel was to open discussion about the challenges for mental health wellness that law students and attorneys face, and discuss how the King Hall community (faculty, staff, students) can address these challenges. A secondary but equally important goal was to normalize mental health struggles and begin to open the dialogue on how common and shared these challenges are among lawyers and law students in particular. I was pleased to be part of a panel that discussed questions about mental health and its challenges from three perspectives: law students, law professors, and practitioners. Also on the panel was Professor Katie Young, currently a post-doctoral fellow at Stanford, who described her current book project on the law school experience with a realistic view of the stressors of law school and how they exacerbate existing mental health challenges and may produce anxiety and depression for students who previously did not experience these conditions. The second panelist, Pamela Cohen, an experienced staff attorney with Disability Rights California, the Protection and Advocacy organization for the state funded to represent the interests of people with disabilities, addressed the difficult questions of disclosure of mental disabilities, more specifically, when and if to disclose and why. She called for students, faculty, and administrators to change the culture from within. In my segement of the presentation, I focused on the much needed culture shift around individuality and autonomy as fundamental democratic values and how they work at cross purposes to de-stigmatizing mental disability. Shared inter-dependency and relational autonomy is more reflective of how people interact and demystifies how people actually succeed in law school and in practice. I also discussed the prevalence of depression and anxiety among the general population --e.g., 1 in 4 people will experience depression in their lifetime--and its higher prevalence among law students--e.g., approximately 1 in 3 law students. I attributed the disproportionate numbers among law students to at least three factors. First, the changing economic climate that results in fewer available "dream jobs" for law students and the realization that the passion which brought them to law school may not translate into a job in that area (at least at first). Second, we celebrate imbalance--that is, people who sacrifice self-care in law school and legal practice get celebrated as "hard workers" and "devoted, tireless advocates"--rather than emulating the person who strives to balance law school or legal practice with self-care (eating well, exercise, social support networks). Third, and relatedly, students come to law school as complex individuals with diverse interests and hobbies and after a short time this rich, deep complexity is reduced to a singular identity--law student. These three factors take a toll on the person emotionally, physically, and psychologically. I also talked about how faculty can help identify law students in need of additional support and begin to shift the culture of silent suffering and stigma attached to mental disabilities. For example, class attendance can be used as a way to check in on students' learning and also their mental health. Students who are on call in larger classes and fail to attend class may potentially signal that they need additional support or assistance. It's a good idea to reach out to these students personally and offer support and an open door. Also, mental health challenges may be a sign or result of academic difficulties. With that in mind, it can be useful to design courses to include formative assessments and periodic substantive checks to get a sense of where the class stands. It's also important to pay attention to students' body language and facial expressions which may signal not only confusion with the materials but general lack of energy, motivation, sometimes associated with depression. Included in my presentation was a quote from Justice Louis Brandeis that I think is particularly apt for law students: "If you would only recognize that life is hard, things would be so much easier for you." Approximately 30 law students attended the panel with strong support from the Dean's Office. In attendance were Senior Associate Dean Madhavi Sunder and Senior Associate Dean Hollis Kulwin. I shared a note of support from Dean Kevin Johnson, who could not attend because of another commitment outside of the law school. I had a great time speaking at the University of Denver Crimmigration Law Lecture Series on March 3. I talked over the lunch hour about the disparate consequences on Latinos of the removal of noncitizens who have committed crimes. The audience had lots of comments and questions. We ate lunch at a wonderful restaurant with the posters below in the window. The afternoon also was eventful, with a close and novel look at the Supreme Court's decision in the trend-setting case of Padilla v. Kentucky (2010). Here is a link to a live stream of a talk by José Padilla, petitioner in Padilla v. Kentucky, at the University of Denver event. 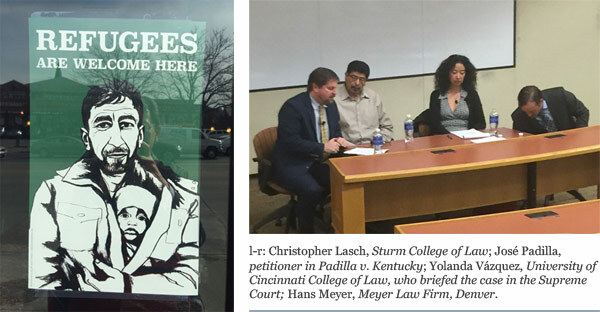 He is joined by Professor Chris Lasch of the University of Denver Sturm College of Law, Professor Yolanda Vázquez of the University of Cincinnati College of Law, who briefed the case in the Supreme Court, and Hans Meyer of the Meyer Law Office in Denver.